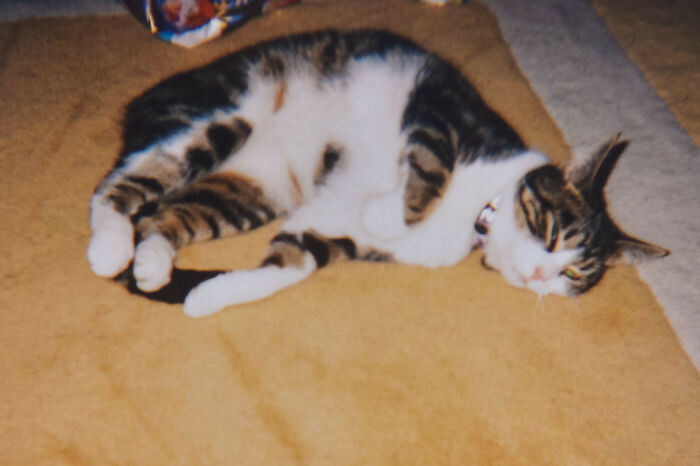 When Boo ran away from home in 2005, at the age of four her owner Janet Adamowicz was completely heartbroken. She did everything she could to get her back home, by putting up posters wherever she could and placing ad's in the local newspaper in her hometown Harrogate, England. But after a year of searching and not finding Boo, she gave up and just hoped that she is healthy and that she found another loving home. Janet then decided to give two cats a new home. First, it was Ollie in 2008 and then Tessie in 2014. Then suddenly 13 years after Boo went missing Janet got a surprising phone call. 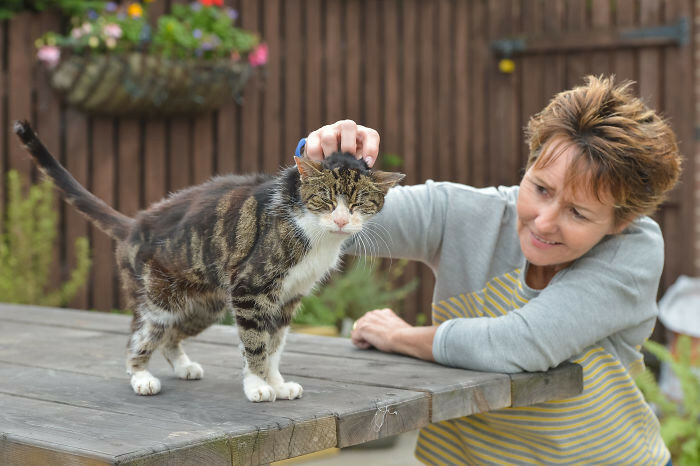 "I got a call on Thursday to say I had a cat missing," Janet said. 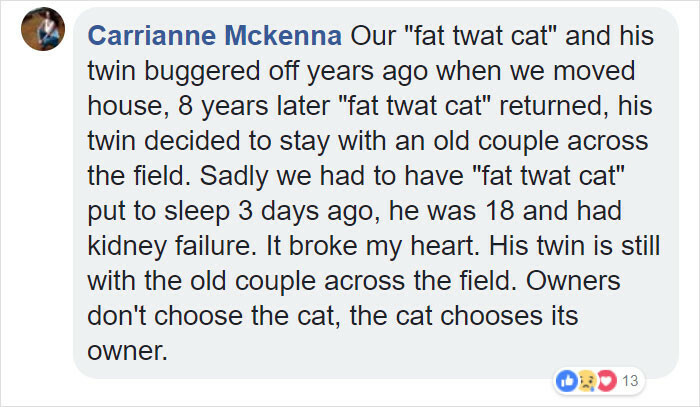 "I said 'I don’t think I do, they’re both here' – but they said we’ve looked on the system it says you own a cat called Boo. I thought it was weird, but I couldn’t believe it when I got to the vets and they had her there – and she still remembered me." "I don’t know where she had been, I think possibly a stray but kept being fed by strangers – or catching her own food." Thankfully Boo appeared to be in good health and has been all on her own all these years. She, however, did have some signs of dehydration and tiredness. 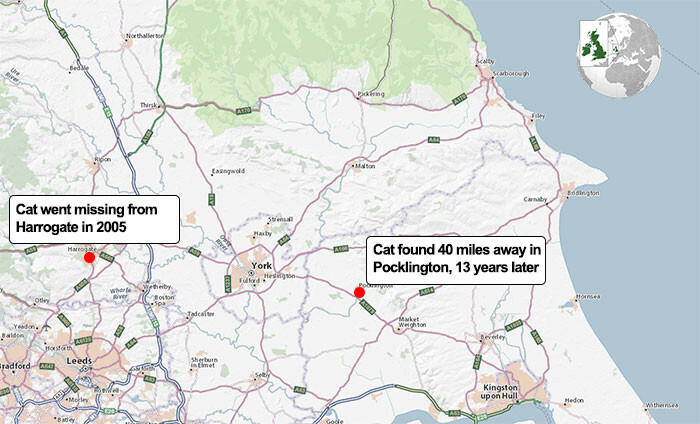 A woman found her in a town 40 miles away from where Janet lives, where she has been lurking for a few weeks and took her to Wicstun Vets in York. 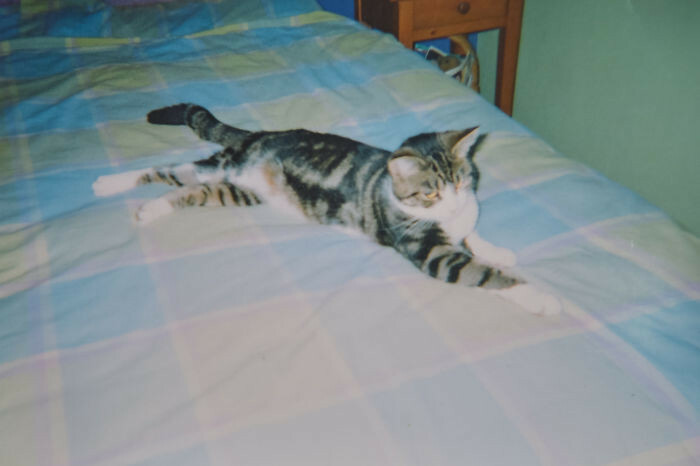 "Boo was very lively as a young kitten and enjoyed the outdoors and adventuring – but would always return home," Janet said. "We don’t know how she got all those 40 miles, it could have been any number of reasons. 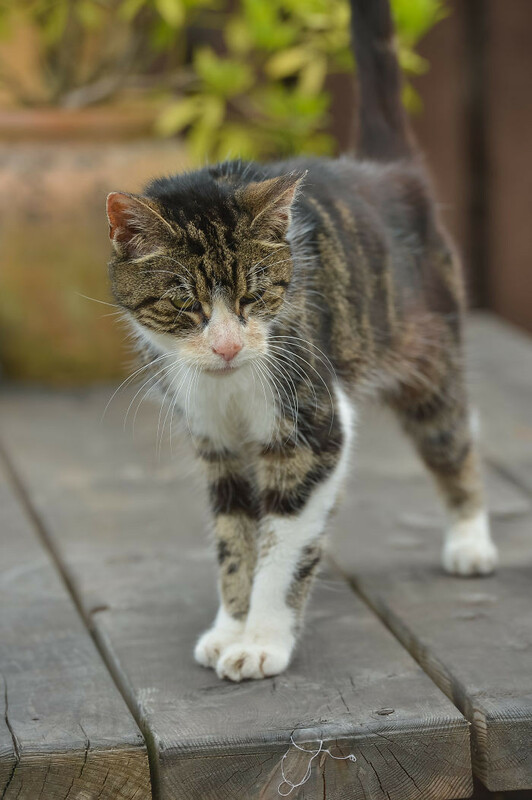 She has done well as a 17-year-old cat to last that long as a stray cat – it really is remarkable." "Despite only being five-years-old she still remembers me and has been my shadow ever since coming home. The other two cats are not impressed, but hopefully, Boo is finally home for good." The vets where Boo was returned to explained the emotional scene when Janet and Boo reunited. "There wasn’t a dry eye in the building," a spokesperson for the vet said. 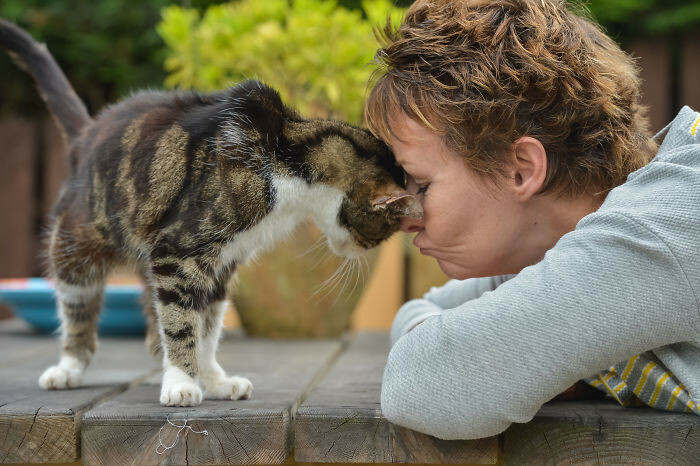 "Boo recognized her mum straight away and within minutes the two were thoroughly enjoying plenty of face rubs, cuddles, and meows." The vet used data from a microchip that was implanted in 2001 and they found a match against Janet's mobile number. The vets used this opportunity to encourage other pet owners to microchip their pets for in case they go missing. "I got a call on Thursday to say I had a cat missing." "I thought it was weird, but I couldn’t believe it when I got to the vets and they had her there and she still remembered me." 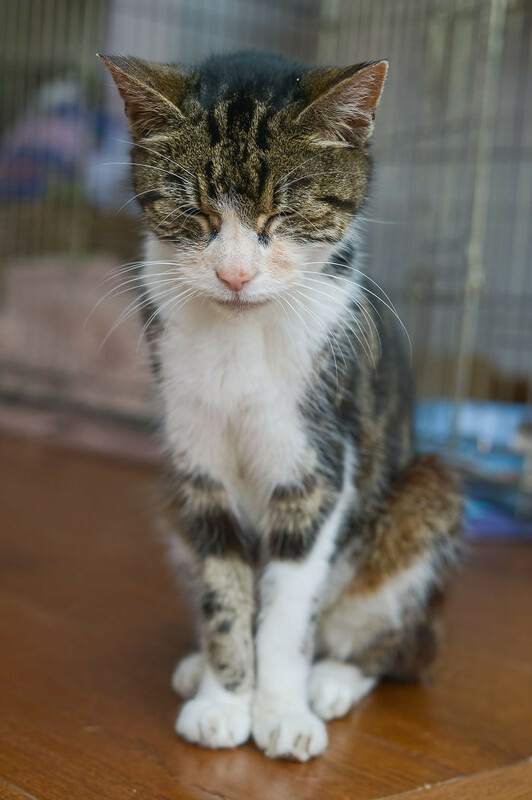 "I don’t know where she had been, I think possibly a stray but kept being fed by strangers or catching her own food." "There wasn’t a dry eye in the building." 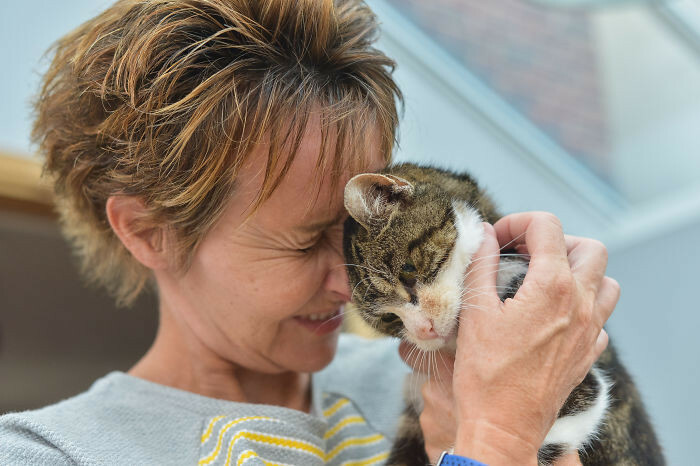 "Boo recognised her mum straight away and within minutes the two were thoroughly enjoying plenty of face rubs, cuddles and meows." Boo was only found because she was microchipped. So remember to microchip your pets for in case something happens! A lot of people responded with tears in their eyes.